On the issue of intrusive inspections, we agree: For a mutually-agreed upon time period, any final nuclear deal with Iran will have to include one of the most comprehensive inspections regime in history. But pushing for the type of inspections we had in Iraq – a constant, indefinite and undefined International Atomic Energy Agency presence – doesn't pass the feasibility litmus test and contradicts what has already been agreed upon in November: Once the final deal expires and Iran has successfully alleviated the international community's concerns about its program, Tehran will become a normal Non-proliferation Treaty state, meaning there will be no limitations imposed on its nuclear program beyond what all other NPT states have to accept. Indefinitely holding Iran to standards that apply to no other NPT signatories is a recipe for diplomatic failure because it violates the November agreement. Our agreement with Ken also carries over to the issue of re-imposing sanctions if Iran is caught cheating. In a final deal, he recommends a snap-back mechanism predicated on sanctions waivers rather than lifting sanctions. But there are two problems with this approach. First, in regards to the waivers, it begs the question: Would the U.S. agree to concrete, irreversible steps on sanctions relief if Iran only offered reversible measures on its nuclear program? Of course not. In fact, the principle of proportionality and reciprocity agreed upon during the May 2012 round of talks in Istanbul established that reversible Western concessions would have to be exchanged for reversible Iranian measures and vice versa. To extract irreversible concessions, similarly irreversible measures have to be offered. Since sanctions waivers are fundamentally reversible, as Ken acknowledges, Iran would only have to offer similarly reversible concessions in turn. If the two sides only exchange such reversible concessions, the deal will be weak and fragile. For instance, instead of ratifying the Additional Protocol – a pivotal transparency instrument – Tehran would only agree to implement it in a time limited fashion, subject to continuous renewal (just like the waivers). This is tantamount to adding a self-destruction mechanism to the deal. Such a deal is harder to sell, and even harder to keep. To be durable, the deal must have strong elements of permanence to it, which requires irreversible measures. Second, the motivation for snap-back sanctions is to disincentivize Iran from cheating. But it is more effective to combine these negative measures with positive measures that incentivize Iran not to cheat. The U.S. must have a plan for potential cheating in Iran, but it must also give the Iranians a reason to feel that the deal is a win so they won't want to cheat. Pursuing a "winner takes all" approach – where Iran front-ends concessions, and the U.S. ambiguously reciprocates in the distant future – will either fail immediately or fail to endure. That approach didn't work in the past, and it won't work today. Neither President Obama nor President Rouhani can sell that kind of deal at home. The biggest reason why nuclear negotiations have progressed is that Washington bought into a principle long advocated in Europe – and Tehran: reciprocity. Ken's final recommendation about the duration of a final nuclear deal is where our positions begin to diverge. At face value, pushing for a deal that lasts for 20, 30 or 50 years may appear attractive. Who wouldn't want to have their cake and eat it too? But Iran's perspective is equally determinant in these negotiations. It's true: We don't know who or what will come after Rouhani's presidency ends. Also true: Iran doesn't know who or what will come after President Obama leaves the White House. Iran will likely reject a deal that lasts beyond 10 to 15 years, not just because of the mistrust that exists between the two sides, but also because of the legitimate uncertainty that exists about the intentions and orientations of future leaders in Washington and Tehran. To go as far as Ken has, however, and push for 20, 30 or 50 years in addition to not lifting sanctions and going beyond the Additional Protocol is simply unrealistic. Such a deal – if Iran ever were to accept it – would last much shorter than the Treaty of Versailles, and potentially carry similar negative repercussions. Instead of creating space for the White House to negotiate a deal, the recommendations in his op-ed narrow the parameters of the debate. A successful deal is sustainable, and gives both sides reason to abide by it and see value in it. But if the deal is too far skewed towards Washington's short-term needs, it will incentivize decision-makers in Iran to cheat. President Obama needs the flexibility and authority to craft a balanced, win-win deal with Iran where both sides feel that they are better off. Overplaying our hand risks squandering the very valuable diplomatic advances that have been achieved. Still, whatever our differences with Ken, his op-ed has launched a much-needed discussion on the critical components of a comprehensive nuclear deal. We look forward to continuing this dialogue. Next entry »'Bubblets' in the U.S. economy? « Previous entryIs China really about to overtake the U.S.? 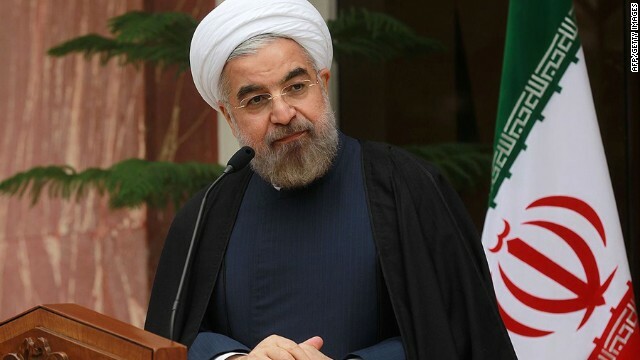 The authors say, the duration of the final deal seems to create a problem: We don't know who or what will come after Rouhani's presidency ends. Also true: Iran doesn't know who or what will come after President Obama leaves the White House". The question is, what will happen to Iran, when the supreme leader dies? He can't live forever! The youth dominates the population. They think the country could do without a supreme leader! There is no unanimity of opinion on what will happen after Khamenei. Sweet Buddha, one read you, john smith, and what you have posted is factual one believes. 1953 was huge error. Was it for oil? One remembers well the '50s and 60s, gasoline was 20, 25cents a gallon! Iran didn't fare well in that Iran-Iraq war, didn't remember that the USA was aiding Saddam H. As Sagan told us, OIL is what the West needs, and anything goes to get SAME. Shouldn't israel's nukes be part of the deal? I don't understand why Iran needs to be defenseless as long as israel has nukes and threatens Iran on a weekly basis? It is a mistaken view that religion must be theistic. Go along with Kongzi, Confucius to Westerners, that to be fully religious a being becomes completely willing to do things the best way for all. Iran will never change. They just aren't worth the time of day. The writer of this article are lobby of Iran supreme leader that love the bomb and rocket to occupy the middle east! 1763 the Brits gained control of the Persian Gulf. In time Iran may rid itself of colonialism. Believe me, Rupert, this one would NEVER live under Islam rule, but one cannot say there aren't many virtuous, good, people there. All joking aside, let's all hope and pray that the upcoming deal with Iran comes through. What we don't need now is another enemy. Iran already has many grievances against us as it is, for instance when we orchestrated the 1953 uprising against the populist Prime Minister Mossadegh and put in the much hated Reza Pahlavi as Shah of Iran while Mossadegh died in prison after being tortured a few months later. Sorry folks, but I didn't write that stupid comment above, and of course none of that mumble jumble is true. Some joker is just trying to discredit me. This bozo feels bad that he voted for McCain and Palin. He is member of the Tea Party and spews out anti-American regurgitation all day long. This clown has got to go. It's as simple as that! Hello Joey. Isn't this clown at 11:30 the same pathetic sorry asss troll that begs people to believe that he is the real Joey? He must be a fan of Sarah Palin. He thinks he's funny, but in truth, he's just a sad sad little troll. Good afternoon Joey, George. I'll tell you what really gets my goat. Here you have an adult, stealing names, posting all kinds of anti-American mumble jumble, and yet is allowed to continue. Now there are two false Joey trolls. "Listen," said the CEO, "this is a very sensitive and important docu ment here, and my secretary has gone for the night. Can you make this thing work for me?" Although everything you said was true, America is not the root of all terror. Those actions are definitely a shame on our country, however if America did not come out the super power after ww2 there would be a lot more bigger wars and less freedom and less economic prosperity then there is now because of America. We have given this world so much that it would seem a bit harsh to say what you have said. If you think the same things, if not worse things would not have happened if Russia or some other power was in charge then you are in denial. We have kept this world in relative stability however we need to learn from our mistakes and not foster more terrorism by thinking we can bomb our way to victory with this situation. Unilateral disarmament is a difficult pill to swallow, esp when the weapon is primarily defensive (an equalizer of sorts) against a proven aggressor (US). What's missing is a discussion on the trustworthiness of America in these talks. More likely if they disarm we will accuse them of hiding WMDs and attack OR after a few years we will fund an insurgency to overthrow the government. Reza Marashi and Trita Parsi have some connections with the Iran dictator regime and trying to help them to get rid of sanctions without actual obligation to give up their nuclear weapon. Iran regime can not be trusted because it always is looking for parts and devices to finish his ballistic rockets and nuclear weapon plans! You don't trust Iran's current government? But I do and make no mistake about it! After all, the Iranians have a greater grievance toward us than we do toward them. Remember 1953, anyone? There is no evidence whatever of an Iranian nuclear weapons program. None. That's right, wbeeman. There is absolutely none at all. The right-wing thugs in Washington are just trying to scare us as usual. The National Iranian American Council is made by mullah regime and trying to support it to get the bomb and expand its empire in the region. Typical vicious defamation on the psychopathic warmongers. Quite true mike, quite true indeed. Iran has every right to develop whatever weapon for self-defense. Israel, Pakistan, India all have nuclear bomb. Great article. Need more like this. Great article. Of course, the usual warmongers, who think nothing of pushing tens of millions of ordinary Iranians into poverty with sanctions, will resort to their old tactic of vicious defamation, in calling the pro-agreement side agents of the "mullahs" and "dictator" regime, but those of us who care for other human beings, and don't want ordinary Iranians destroyed by sanctions, and America to waste trillions on wars and lost trade, support rational pro-diplomacy individuals like the authors. Medical experts agree that Sarah Palin's strange behavior and inability to string together two complete sentences is a result of having been kicked in the head by a moose. Poor moose. The moose had to spend the next 4 months in a cast after he kicked that head full of rocks. 1.Iran already invested around $ 160- $170 billion in nuclear program, and it will NOT gave up too easy to get nuclear bomb! 2.It was unacceptable to me that Iran did NOT allowed to UN inspectors to double check 2 secret locations in Iran (secret military base at PARCHIN and underground Uranium enrichment plant at FORDOW) and Iranian’s PLUTONIUM production in Iraq ??? 3.Does USA and EU want to get nuclear bomb in suitcase, during next 3-5 years from Iranian TERRORIST’S “friends”: Hamas, Hezbollah, Iraqis militia…??? *”Iran’s supply of yellowcake would last 30 years at current enrichment rates. Once you quoted "AIPAC facts" you lost all credibility. AIPAC does not deal with facts. By the way, what business of the IAEA (not UN inspectors) is it to inspect Parchin. Does any other country allow the inspection of its military facilities? "Opinion: How to get Iran deal"
Great article. Negotiate an agreement that allows nuclear power, with inspectors to prevent nuclear weapon development. Obviously this is the only realistic solution. Iran is a growing world power, and like China, we will work with them to build a constructive relationship. Well said, sly. Thank you. Islam always relies on an"Eye-For-An-Eye" negotiation, unless Muslims are threat, coerce, intimidated is NOT going to work. All Muslim societies and organizations exert some kind of coercion to impose their rules. The suggestions of Kenneth Pollack which the authors cite is based on fantasy. As the Deputy Foreign Minister of Iran Araghchi stated recently, it is the U.S. that has to make tough decisions. Iran is not compromising on its rights. Interesting that everyone talks about the ways and means of successfully limiting the Iranian nuclear program from this point forward, but no one mentions the North Korean factor. Iran and North Korea have been collaborating on their nuclear and missile programs for years. That was reported years ago, and has been evidenced by the presence of North Korean officials at Iranian missile tests, and of Iranian officials at North Korean nuclear tests. By virtue of such a collaboration, the North Korean nuclear tests have been, in fact, Iranian nuclear tests, as well. But, they are never discussed in that context. Taking note of the collaboration would necessitate doing something about it. If, indeed, Iran shares the technology and data relating to the nuclear tests in North Korea, then Iran stands ready to produce a nuclear weapon, if it possesses nuclear grade uranium. Advocates for the proposed agreement between Iran and the USA claim that the agreement will prevent Iran from producing nuclear weapons. However, the time required to refine lower level uranium to nuclear grade uranium has been estimated at about three weeks. And so, that is the extent of the "protection" that might be afforded by the proposed agreement. Further, if Iran and North Korea are collaborating on nuclear weapon development, whatever Iran cannot do in Iran can be done in North Korea. In fact, it may have already been done in North Korea. Why isn't the North Korean factor mentioned? Because the diplomacy that is touted as the solution to all international problems has not worked with North Korea. Diplomacy is matter of words, and its value depends entirely on the value of the words. North Korea has already proved that it cannot be relied upon to keep its word. Some say the same of Iran and the USA. Why are the talks proceeding, despite the issue of the collaboration? Probably, because they could not proceed, if the collaboration was brought into the discussion. Obama wants the agreement, because it enables him to make the claim that he has kept his commitment that Iran will not be permitted to acquire nuclear weapons. Iran wants the agreement because it frees Iran from onerous sanctions. If the agreement is signed, Iran will probably replace Israel as Obama's "peace partner" in the Middle East. The US nuclear umbrella, long the symbol of US military power, will be replaced in the Middle East by the Iranian nuclear umbrella. Saudi Arabia, one of the previously announced targets for Iranian attack, has already dusted off its Chinese nuclear-capable missiles, in readiness to confront a nuclear Iran. Israel, the other previously announced Iranian target, is confronted with the prospect of a nuclear-armed Iran that is a "peace partner" of the USA, and the Islamic doctrine, "death to infidels". You are talking nonsense. Iran and NK may collaborate in certain areas, but there is no comparison between them. NK is an irrational and despotic country that constantly threatens its southern neighbor. It has also tested nukes. In contrast, Iran is arguably the most democratic state in the Middle East and has shown no interest in nuclear weapons. If you disagree, please provide your evidence. Also, Iran has threatened no one, including Israel or Saudi Arabia. At the same time, the U.S. and Israel constantly threaten Iran with, "All options are on the table." I hope you are not going raise that silly lie about, "wiping out Israel." If you still believe that myth, you are beyond hope. Google it if you don't believe me. Agree @ quinterius. If Iran had wanted to develope nukes they wouldve done so along time ago. And sxs is correct also...if all these other countries have them then who are they to say Iran cant? Its ok @wbeeman, anyone with an ounce of common sense knows if Iran had wanted to build nukes theyve had the means to have done so already and have not! Not to meantion that it is crapola comming from Israel that has put the notion out there anyway! And Netanyahusanidiot just is itching to have us go to war with whomever his mood of the moment is. Which in this moment happens to be Iran. If you ask me Israel should be forced to give up THEIR nukes! A United Nations report indicates Iran has developed a new long-range missile launch site and nuclear warheads.! The USA gave the Iraq and Syria to the Shia dictators that supported by the Shia iran regime to courage the mullah in Iran to give up the bomb! But Iran regime fooled the 5 + 1. They love bomb and ballistic rockets! Reza Marashi and Trita Parsi are regime's lobbies. Even a 15 years old Iranian knows that this regime wan't the bomb and it's a threat to the world. I can't believe that CNN is publishing regime's lobbies's material.